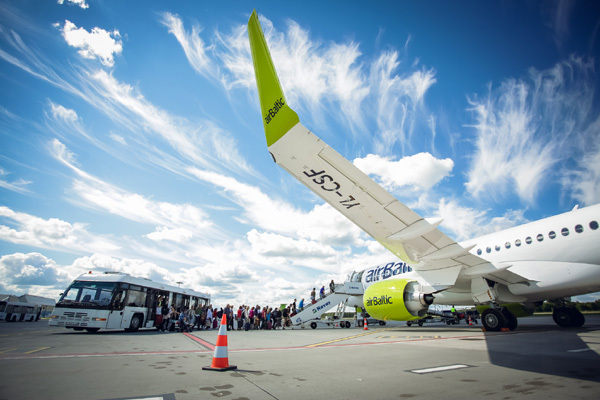 Latvian airline airBaltic carried a total of 729,897 passengers in the first quarter of 2018, up 24 per cent compared to the same period last year. In March 2018, a total of 280, 724 passengers travelled with airBaltic, a 25 per cent increase in comparison to the the number of passengers that travelled with the airline last year. In March 2018, the airline operated 4,216 flights, 15 per cent more than in March 2017. During the first three months of the year, airBaltic operated 11,591 flights. The airline’s load factor, which represents the number of passengers as a proportion of the number of available seats, was 72 per cent in March this year, but during first quarter of 2018 airBaltic’s load factor was at a level of 67 per cent. The 15-minute flight punctuality indicator for airBaltic reached a level of 90.1 per cent in March. This means that more than 90 out of every 100 airBaltic flights departed at the planned time or with a delay of no more than 15 minutes. The flight punctuality indicator during the first three months of 2018 reached a level of 89.8 per cent.